Despite having a preference, any successful studio engineer would not pin their success on the use of only a single microphone. With such a variety of tonal character and performance traits available through the masses of studio microphones on the market, engineers would be disadvantaged if they were to apply the same microphone to every situation. Choosing the right mic for the application is the first step towards achieving a well-rounded and respectable mix and can often determine the success of your results, more often than your ability to correct after the recording process has finished. On the other hand, choosing the wrong mic can often leave you with unsalvageable results and unhappy clients – which isn’t ideal, nor great for your reputation. The question is; What type of microphone is best-suited to various situations, and why? Dynamic microphones take a much more of a ‘rugged’ approach to audio recording than that of a Condenser. They are capable of withstanding much higher frequencies and SPLs (Sound Pressure Levels) and are purpose-built to withstand life on the road, whether it’s their general resistance to moisture or ability to comfortably survive dropping or two. This makes them ideal for use on stage, but still highly applicable to high-volume studio work like drums or guitar amp micing. Dynamic microphones do not require additional power such as an external power supply or phantom power and instead utilise the motion of a conductor within a magnetic field to generate an audio signal. 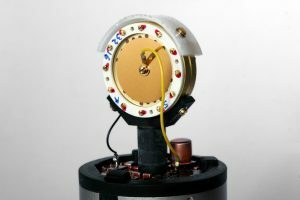 Sound pressure makes the very-thin, lightweight diaphragm fluctuate and causes the voice coil suspended in a magnetic field to move, thus generating a small electric current. The Shure SM57 & SM58, both household names, have performed on tracks all across the world spanning decades upon decades, and for good reason. Their ability to achieve great results in suboptimal scenarios has led them to become two of the most sold microphones in history. It’s safe to say, that any good venue you can think of will have at least five or six of these kicking around and despite the age, cosmetic or condition, all will likely turn on and perform as they originally did upon purchase. For the truest replication of the source of audio that you wish to record, look no further than a condenser. 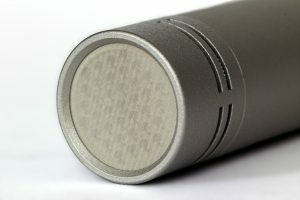 Condenser microphones are much more responsive to the slight changes in sound waves than that of a standard dynamic mic and provide a broader tonal coverage. They also generally have a louder output but are much more sensitive to loud sounds. The close placement of the thin stretched conductive diaphragm and metal disk backplate create a capacitor that’s externally powered by an external voltage source such as Phantom Power (+48v) or dedicated Power Supply. The sound pressure creates minute vibrations in the diaphragm and causes the capacitance to vary, which in turn creates a voltage variation – also known as the signal output of the mic. Using this as the functional template for all condensers, these types of microphone come in either solid-state or tube variations and a wide range of colours, sizes and designs. Most studio microphone collections will consist mainly of condensers as they’re incredibly reliable and are arguably the most practical for the majority of situations – I’d say definitely they’re a contender if you are looking for your first all-around recording microphone. Ideal for use on Vocals, Drums, Amp Micing and much more. Brands like Rode, Aston, SE, Neumann and AKG are producing high-quality microphones constantly, these names are always a great starting point if you’re looking to make a purchase. A valve microphone is essentially just a condenser microphone which uses a valve amplifier rather than a transistor circuit. The character is often described as having an extra level of warmth to that of standard condensers, thanks to the use of tubes and their ability to evolve over time or perform better once headed up/worn in. 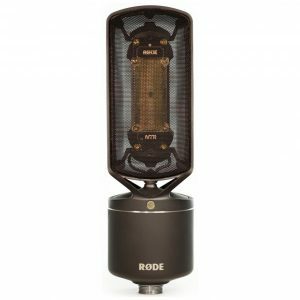 A great choice microphone for those in search of a more vintage’ style condenser with an extra level of microphone colouration. These can be eccentric microphones to use and require careful handling to achieve good results or a damage free experience! They have a tendency to resonate the proximity effect (the bass response when the microphone is moved closer to the source) thanks to their pressure gradient devices, which is a great advantage for those looking for warmth but can be disastrous if the proper care isn’t taken. Ribbon mics instead function by responding to the velocity of air molecules moving a small element suspended in a strong magnetic field, rather than the standard Sound Pressure Level (SPL). This eliminates the ‘live’ and ‘excited’ feel found in other types of microphones and provides a character that truly varies from that of a condenser or dynamic. However, the side effect is a highly-delicate microphone that’s more exposed to the elements. Ribbon Microphones do not require any external power, most vintage Ribbons will be harmed if not destroyed by the presence of phantom power – so keep clear of (+48V) and make sure it’s switched off to begin with. USB microphones bypass the need for an external interface or preamp, providing both internally. This makes USB mics a great asset for podcasters or anyone after a simple, easy to use solution without the technicalities. They work very much in the same way as traditional microphones, featuring a capsule, diaphragm, etc. 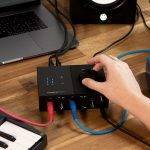 However, the internal circuity means you can literally connect it via USB to your computer, load up your chosen software and begin your recording session hassle free! Diaphragm size is important and well-worth understanding. Different applications will call for either a small or large diaphragm (and more recently, medium diaphragm) microphone, both of which play vital roles in the studio. As a general rule, “large” means the capsule’s diaphragm is 1 inch (25.4 mm) or more in diameter; “small” means it is ½ inch (12.7 mm) or less. So what are the sonic differences and how can we apply them to make your decision easier? 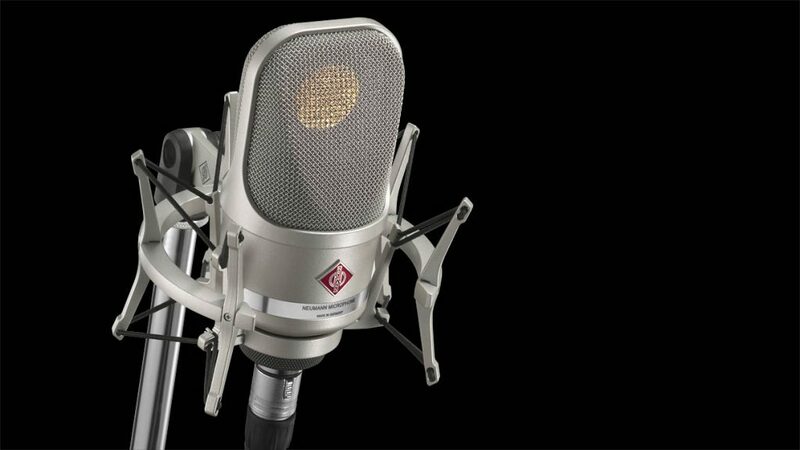 Large-diaphragm microphones are a must-have for studios all over the world. Prized for their noise performance, they offer much lower levels of noise than that of SDM’s and superiorly overcome the noise of the tube electronics. Their wide frequency coverage makes LDM’s Ideal for use on vocals, capturing the full spectrum of voices of all types. LDM’s are also a favourite for applications such as strings, brass or practically anything else with a broad frequency range. These mics are not confined to one style and can be applied in about as many ways as you can imagine. With a wider coverage of the spectrum, it’s easy to assume that a LDM is better suited than a SDM 100% of the time, but this isn’t the case. Sometimes, the additional body that ann LDM provides can be more than the mix needs, and this is where SDM’s come into play. Examples of LDM’s include Neumann’s TLM 107 or notorious U87, AKG’s C214 and even Shure’s SM7B. SDM’s like the KM 184 usually conform to a pencil-shape with the capsule at the end of the body tube. Hence the term ‘pencil mic’ is commonly used and is often a better indicator that you’re using a SDM. 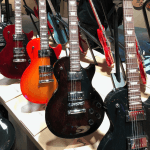 Although SDM’s can have a respectable coverage of the low-end, they are not traditionally the first choice for bass-heavy applications and rarely get chosen over a LDM for these types of applications. Small diaphragm microphones are arguably the first choice for acoustic and often stereo applications such as acoustic guitar or piano, as they help to create space in the mix and don’t clog up the low end with heaps of unwanted frequencies. Engineers who specialise in recording predominately classical music tend to exclusively use small diaphragm condensers. Thanks to their consistent pickup patterns, small diaphragm condensers are superb at capturing choirs, ensembles and orchestras. They also make great overheads on drum recordings, eliminating a lot of the unwanted frequencies that may occur from the snare or kick. Examples of SDM’s are Neumann’s KM184, Rode’s M5 or AKG’s Perception 170. So what are Polar Patterns? 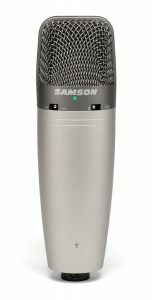 A microphone’s polar pattern is the 3-dimensional space that surrounds the capsule where the sensitivity is either cut of amplified. The result is a sculptured space in which your microphone receives audio. As you can imagine, there’s endless shapes and sizes you can use. So let’s cover the basics. Cardioid refers to arguably the most used and important of the polar patterns. 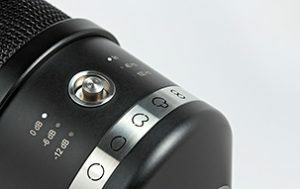 Microphones with a cardioid pattern specialise in picking up what happens in front of them while eliminating a lot of the resonations and feedback that occurs behind and either side of the microphone as seen in the picture. This pattern is highly popular for multi-micing situations like drums, as you can evenly distribute the microphones so that they cover what you want to hear and eliminate any unwanted space. It also works great on vocals, eliminating what goes on behind the mic and thoroughly dialling in on what’s coming into the front face. It’s worth noting that the proximity effect (bass response increase as you the audio source moves closer to the mic) is heightened when using any patterns other than omnidirectional, Cardioid included. 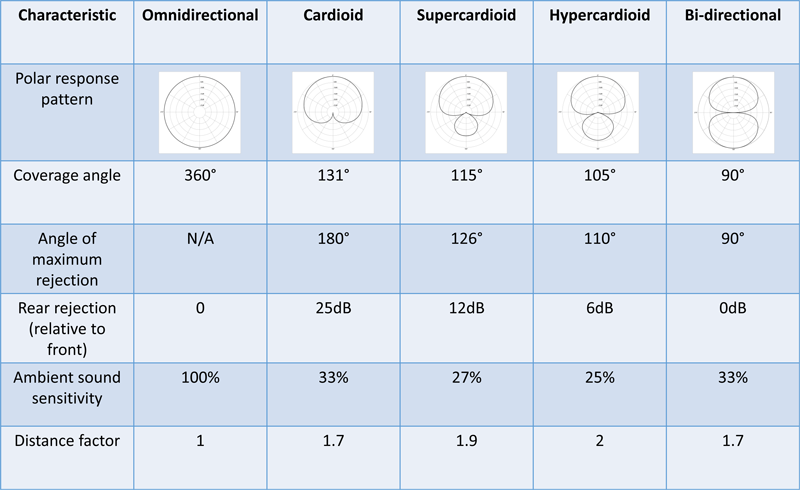 Supercardioid is an extension of cardioid, offering a more directional collection of audio that occurs behind the mics front face. Hypercardiod offers an even wider directional extension. Note: the small additional bulb that these mics cover slightly increases the difficulties of correct positioning. Yes, you guessed it, this pattern features the shape of figure 8. It focuses equally on sounds that are picked up in front and behind the microphone while ignoring any frequencies that occur either side. Also known as bi-directional, this polar pattern has achieved some interesting results over the years! Omnidirectional captures audio equally from all angles. This places you in the middle of the circle and provides you with a 360° attention to detail, much like your own ears. Before a mic has it’s default polar pattern applied, they will perform as omnidirectional. There is no proximity effect either on omnidirectional mics, which makes them great for roomy, atmospheric and binaural work. If you’re lucky enough to own a microphone that does a little of all of the above by offering multiple switchable patterns, then you can apply any of these patterns to your own work accordingly and see which work best. Commonly, Omnidirectional, Cardioid, and Figure-8 patterns make their way onto most modern microphones, whilst some microphones like Neumanns TLM 107 to offer a little more with up to 5 patterns. So which type of microphone is for you? Microphones come in all shapes and sizes and are made for a multitude of different applications like vocal recording, instrument recordings, broadcast, live performance, theatre, board meetings and more. 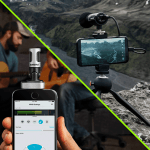 If you’re looking to sing on stage, you’ll likely want a handheld microphone. 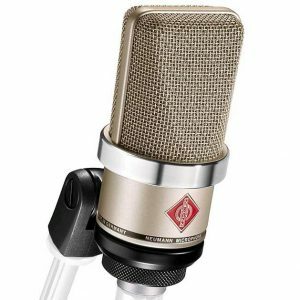 If you’re looking to record vocals or acoustic guitar in a studio, a large diaphragm condenser mic might be the best choice. For presenting or fitness classes, a lavaliere or headset mic is generally the way to go. Micing up instruments like drums would be a mixture of dynamic and condensers. We have stock of dynamic mics, typically used for vocals or instrument micing, USB mics for quick plug and play recording or podcasting, valve mics for adding warmth to your recordings, broadcast mics for news presenters and condensers for anything from recording to live performance. 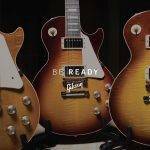 We stock all major brands like Shure, sE Electronics, Rode, AKG, Audio Technica, Neumann, Aston and Audix which are available for fast delivery. If you need some help choosing, give our microphone experts a call on 01273 665413. Click here to see our TOP VOCAL MICROPHONE PICKS FOR UNDER £500!